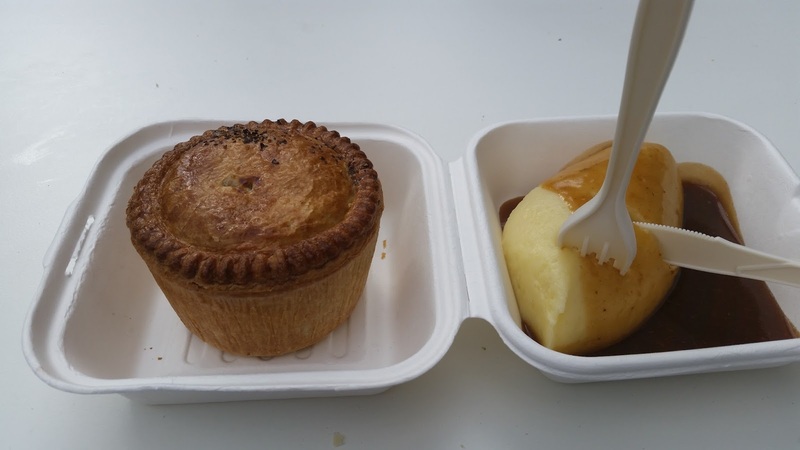 Pierate - Pie Reviews: MyPie Steak a claim for the top London pie! Street Food Markets are a great place to sample the delights of the local food scene and of course London has more than its fair share of food providers! 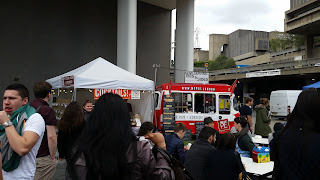 So this weekend, basking in the sunshine of a late September heat wave, two Pierateers headed down to London’s South Bank Street Food Market, at the back of the South Bank Centre, for another taste of MyPie. You may have heard of the name. After all, MyPie have already had their Chicken pie rated as the highest ranking Chicken pie in London at 6.39/7. And we just recently announced that Chris’ pies will be headlining our 6th Birthday Pie-rty on 14th November, which we’re really looking forward to! So what pie were we rating this time? 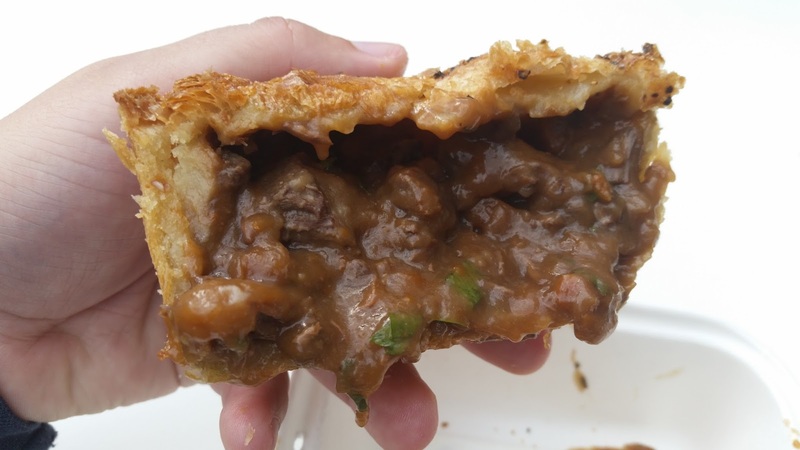 Well, it’s no secret from a quick glance at our 500+ pie rankings that we’re rather a fan of steak and ale pies, so knowing that Chris had this flavour in his repertoire, we knew we needed to get our hands on this pie! However it became clear after Pierateer Rob first sampled these pies that there was something particularly special about them, which was why Pierateer Sam (on Saturday) and Pierateer Rob (on Sunday) popped down to London to officially pie rate these steak and ale beauties! With such a large number of food suppliers at the South Bank Street Food Market, you had to infiltrate the hustle and bustle of the market to get across to the MyPie truck, hidden away slightly at the back of the market. However with its distinctive red and white décor and the word “pie” on it numerous times, it wasn’t hard to know we were in the right place! 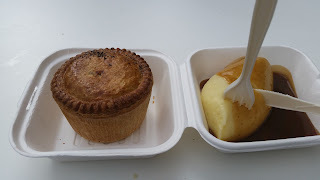 This was our first experience of being served from the converted ice cream van’s hatch, as Pierateer Rob had previously met Chris in Wimbledon to get his hands on the chicken and steak pies. Service was quick and easy, with the main dilemma being “mash or mustard mash” and how much gravy to have with the pie and mash. Of course being a piefessional, Pierateer Rob opted to have the pie in one tray and the mash doused in gravy in the other. When you’re rating a pie, you want to just rate the pie. No excuses for additional mash/gravy influencing the rating where at all possible! So how was the steak and ale pie? Well… “wow!” Does that help? Perhaps “one of the best pies I’ve ever eaten” is a bit more descriptive? After over 500 pies being rated on the web’s leading pie review blog it can be hard to get amazed at filling fully encased in pastry anymore. But there you would be wrong! The pastry on the MyPie steak and ale pie is near spot on. It’s crisp on the outside and a bit softer and gooey in the middle, not too thick but with great structural integrity. You can pick it up with your hand. You can cut easily through it with cutlery (even plastic cutlery!) and most importantly it just tastes delicious. End of! A key indicator we look at with pastry is “would I eat this pastry on its own, without filling?” – and the answer with MyPie pastry is a definite “of course I would!! !” While you could perhaps give it a slight critique that the design is quite simple, it stands tall and proud, just like the ultimate pie should! But a pie is not pastry alone – as we recently pointed out when being interviewed for a national newspaper. It is the balance between filling and pastry, which we refer to as the filling:pastry ratio, that really makes or breaks a pie. And this pie’s ratio is near piefection. Never was I thinking there’s too much filling or (as is more common on lower quality pies) there’s too much pastry. The ratio was spot on, with a near full capacity of filling in the pie. The flavour of the filling was so nice and meaty and the steak so tender. It had a small amount of veg, a nice taste of herbs and a flavoursome aley gravy, which gave it a slightly fruity feel. Fantastic – a bit like a casserole that my grannie would have made (except much nicer). The gravy was just the right thickness to be moist but not leak all over you. The pie had been slightly stronger seasoned in the first pies that we both tried than in the second samples, with the stronger seasoned pie (rosemary and pepper) more to Sam’s taste and the slightly less seasoned one more to Rob’s. We put this slight variation down to these pies being handmade in small batches, with a bit of season variation such as the rosemary available in Chris’ garden when we tried the first pies, which was less apparent in the second pies. But the bottom line is that we both thought these were all some of the best pies we’d ever had, and the best we’d had this year. Chris has done a fabulous job with these pies and we wish him and his MyPie em-pie-re all the best for his exciting future expansion plans! With pies like these, he is definitely onto a winner! They are once again Pierate Highly Recommended and at the time of reviewing are the new top pie in London!